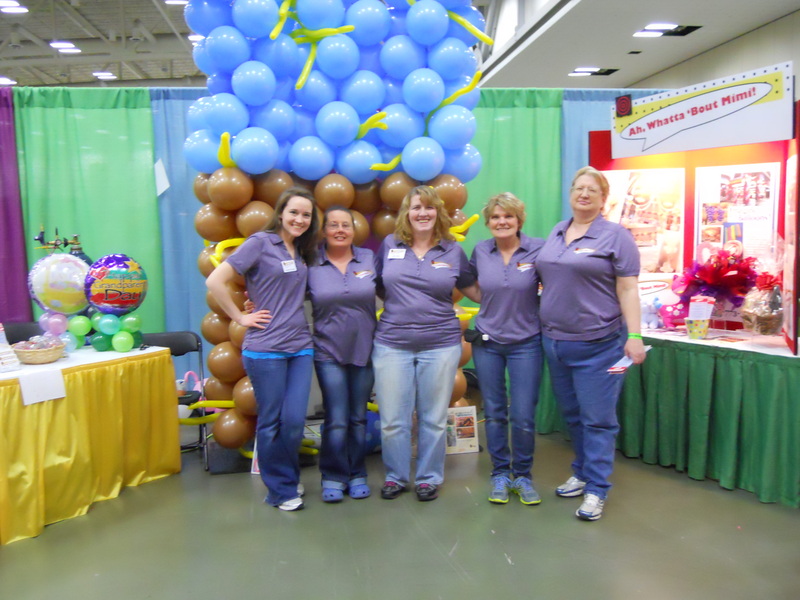 We recently partook in Louisville's kids' fair for the first time and had so much fun. We decided that our booth should be farm themed and it was a great success. 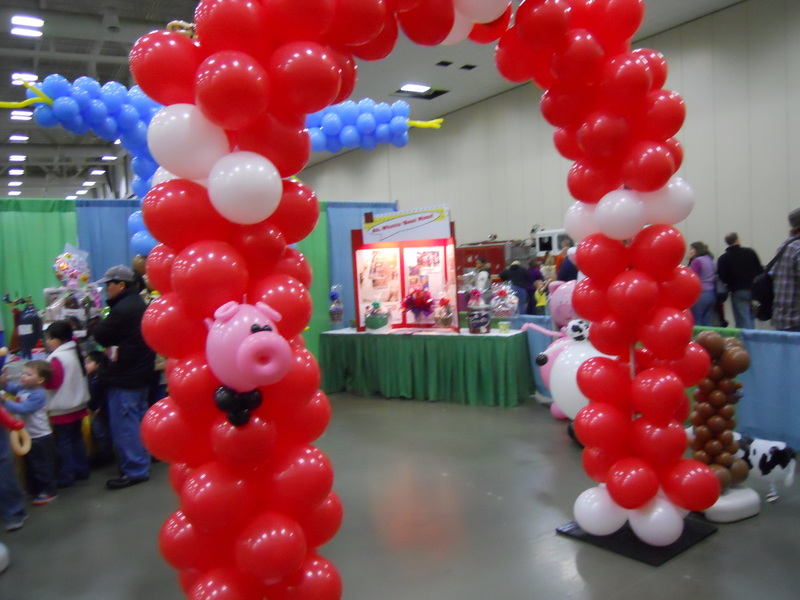 Our arch represented a barn and had a cute little baby pig sticking out of it. We started off having kids help us make mini balloon towers that they got to take home with them but our line never seemed to end. 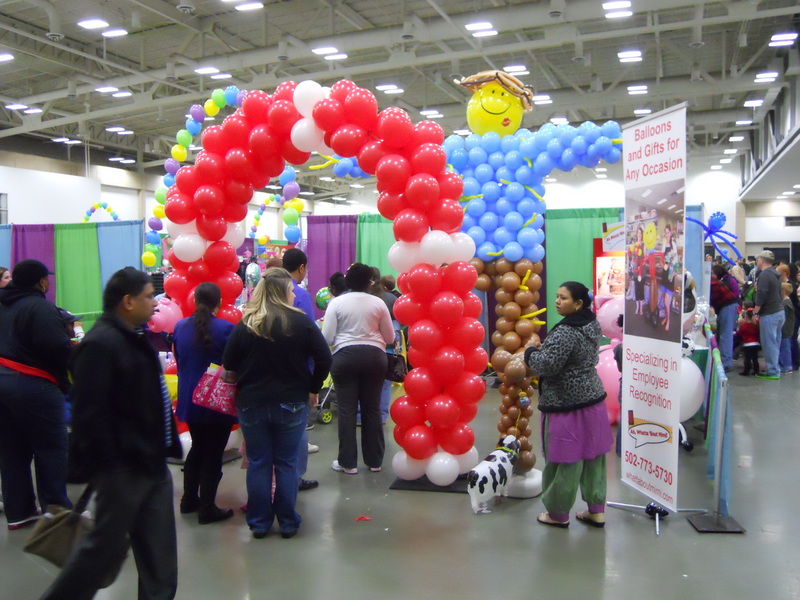 They got to pick out 8 small balloons and we helped them pump them up with small hand pumps. Then formed quads and attached their choice of foil balloon or smiley face to the top. 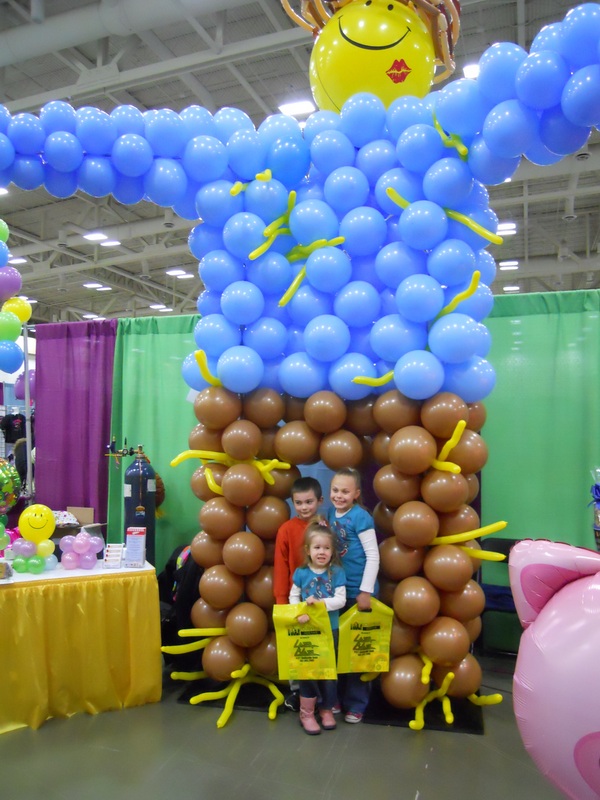 A lot of kids just wanted to blow up a few balloons, and I mean who wouldn't want to? It is fun! We do it every day at Ah, Whatta'Bout Mimi (http://www.whattaboutmimi.com). Our mini towers make the perfect centerpiece for a table or display so if you want one just let us know. Our scarecrow man was a HUGE success (pun intended) and kids loved having their picture taken with him and going in between his legs. 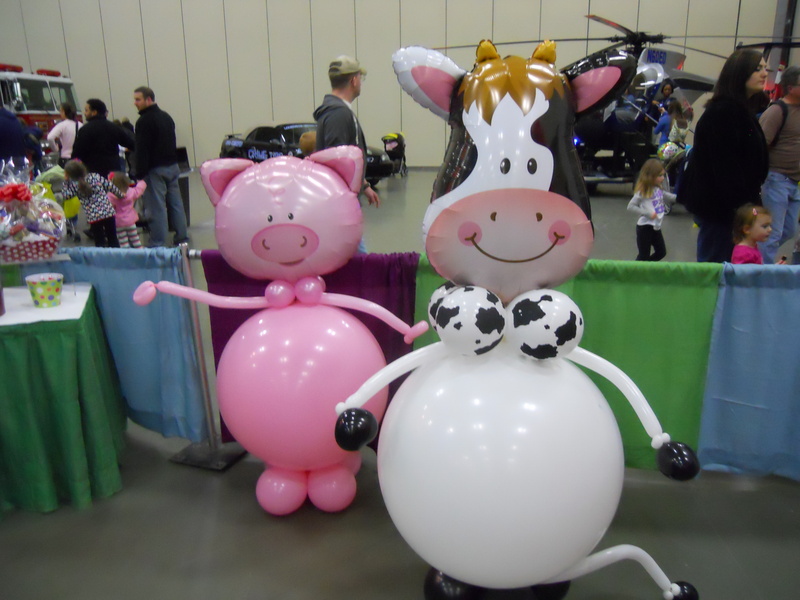 He watched over our little cow and pig balloon sculptures, little farmer boy, and display table. We modeled him after our giant Frankenstein we did for a Halloween ball, which you can see in a previous post. We had so much fun walking around with our "My Own Pets" and letting the kids pet them and play with them. They were a huge success. Every kid wanted their own pet to follow them around. They also added a lot more animals to our farm. Getting people into our booth was simple. We had the eye catching balloons which were perfect for parents and grandparents to use as backdrops for their kids pictures. We handed out flyers with our information and hopefully will be getting to do more themed birthday parties! These are always so much fun and give us the opportunity to grow creatively with our design skills and conquer any challenge. 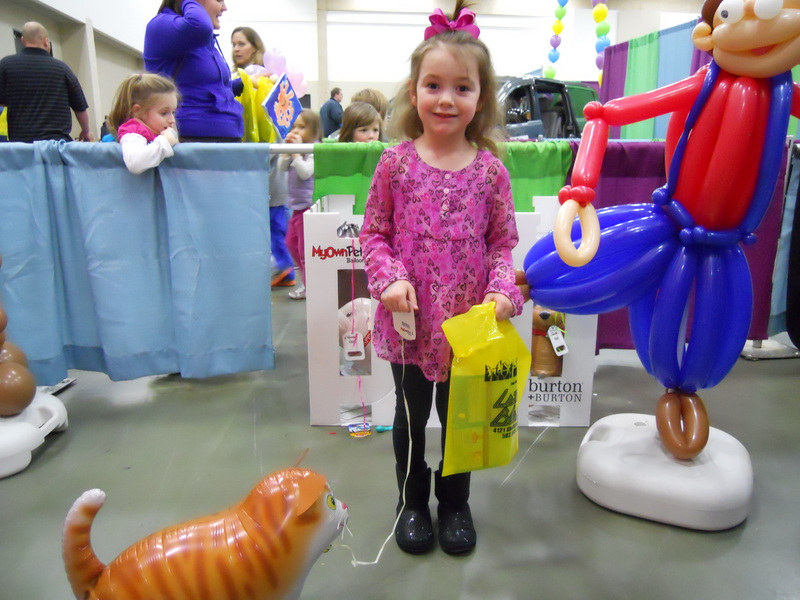 There was so much to see and do at the Kids' Fair and most of the people were really awesome! We love getting to interact and meet new people. Plus one of our main motto is "Recognizing people" making them feel better and more simply put "making lives better by brightening them".